S/C 160-180 cm M-25 lt.
40-50 cm – M-130/160 lt.
50-60 cm – M-130/160 lt.
60-70 cm – M-130/160 lt.
Punica Granatum is a small deciduous fruit-bearing tree that can grow up to 5-8m in height. Its leaves are glossy, narrow oblong, entire and 3–7 cm long. Its flowers are bright red and its fruit is the pomegranate, a berry of intermediate size with a thick reddish skin. 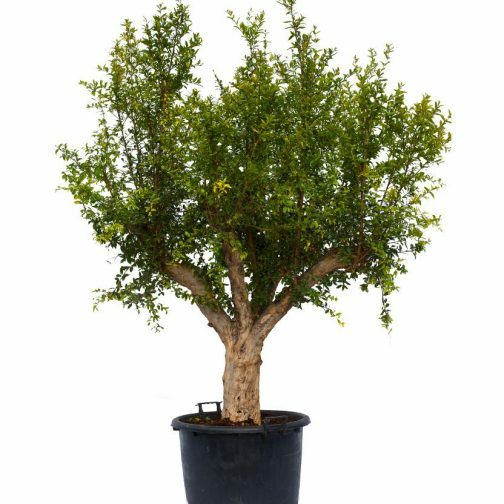 We have Punica Granatum plants available in many sizes and they are very decorative for both outdoors and indoors.